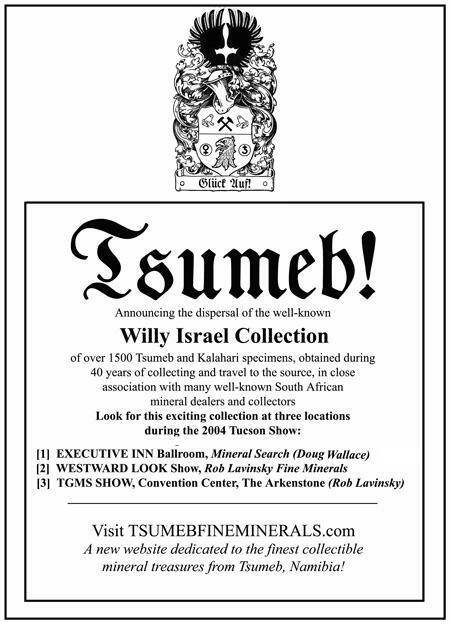 The Arkenstone presents Tsumeb Fine Minerals. Please visit www.mineralauctions.com for the best in-house mineral auction venue on and off the internet. mineral treasures of Tsumeb, Namibia! This site will be dedicated to showcasing the incredible wealth of collectible mineral specimens that came from the Tsumeb mine over almost 100 years of mining. 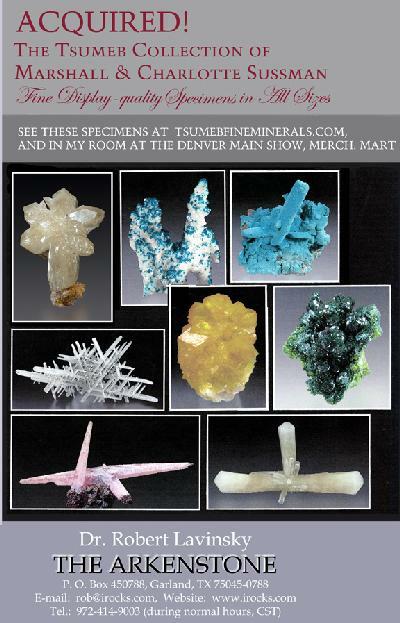 Most of us, even dealers, never get to see so much of the fabulous array of minerals that have come from this extraordinary location all in one place. As I obtain collections, Tsumeb specimens will be constantly added to this site. It is going to be a constant work in progress, with the ultimate goal of becoming a repository not only of specimens for sale but even more importantly as a reference guide for what is available on the contemporary market from this important location, and how that representation changes with time. SPECIAL TSUMEB-related EXCERPT from What's Hot in Tucson 2008 video! Dave Wilber and Bryan Swoboda, creators of the new hobby-show video series, What's Hot in Tucson 2008, have allowed me to post this short video excerpt from their video. It features Marshall Sussman discussing his Tsumeb collecting career (and their SECOND collection, built since 2004). To order their video, CLICK HERE here for more information , and click on the link above to go directly to the posted interview. I recommend their video highly! The historic extra-large 1977 issue of the Mineralogical Record, presented in full (with permission) for the first time online. COBLATIAN SMITHSONITE: Crystallized in a variety of pink to red colors - as fine a suite as ever I have seen in one place!